July’s ATC theme was Hawaii. Wilma (3 hula girls) and Charleen. Thank Charleen for taking the pictures! Next month the theme is Back to School. I haven’t been posting anything for awhile. I have been recovering from a medical problem. I received this adorable Get Well card from Sandy H.
This card definitely made my day and put a smile on my face! Also thanks for the gift card. 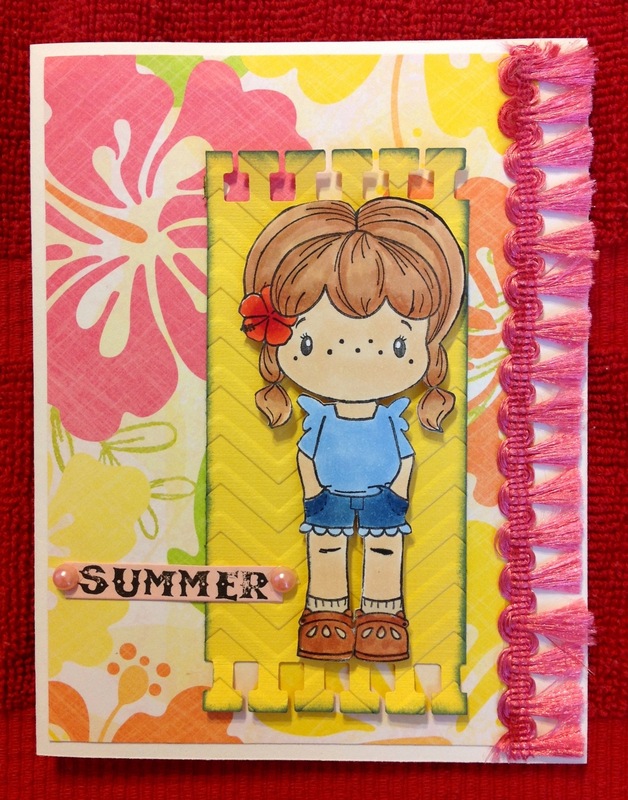 Sandy used my favorite stamp line: CC Designs. Karen sent this thank you card, sooo beautiful! She always put so much details on her cards. I like the stitching on the card. One day I will try it out. Love the flower dies. Which die is it? She also sent me some stamps. Made this very quick and easy card using Paper Smooches Stamps found at Cute Stuff. Stamped, cut out, used the stylus to puff up the flower, stickles and glue down. Check out the blog on http://www.papersmoochesstamps.com for more ideas. Picked up this NEW stamp by CC Designs Rubber Stamps at Cute Stuff. 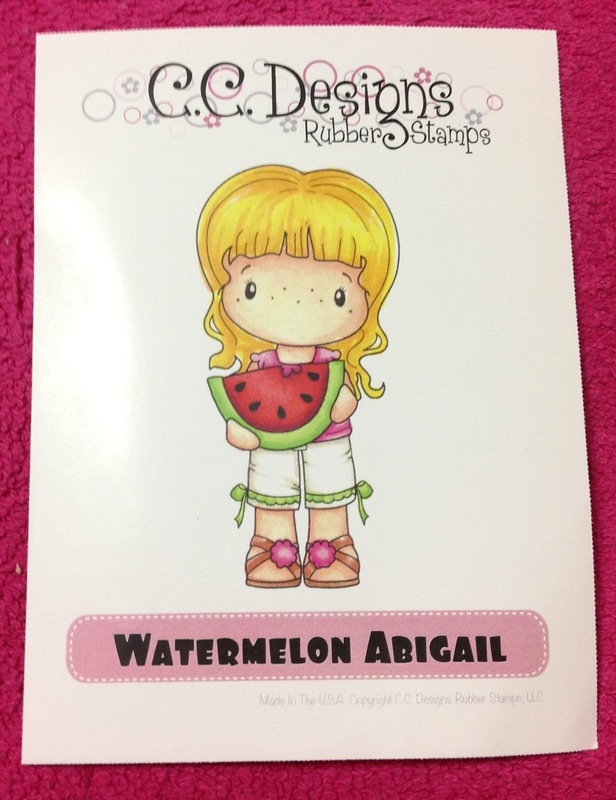 The stamp is called Watermelon Abigail. Used the Spellbinders Resplendent Rectangles. Added red polka dot washi tape and a button. 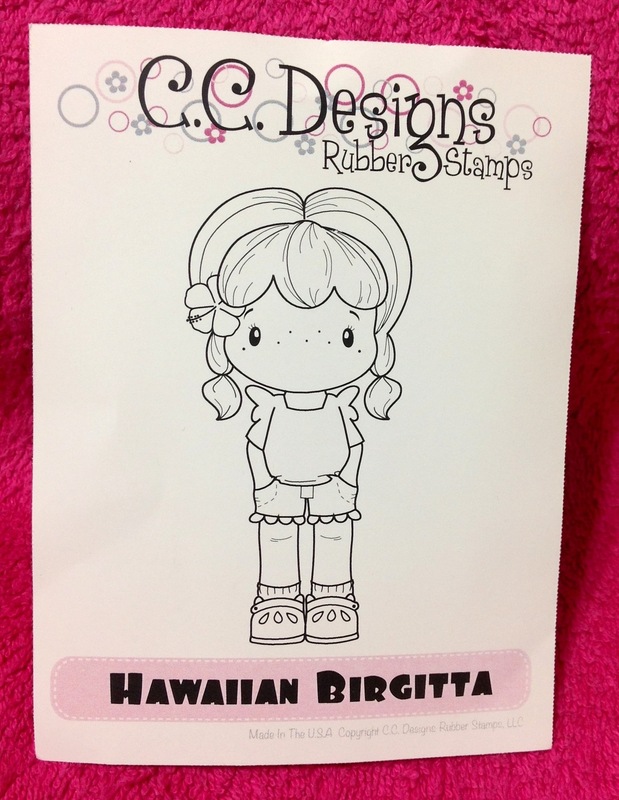 Used the CC Designs Hawaiian Birgitta. Used the Fiskars Border Punch called Notebook. Wasn’t able to find this punch locally. Found this one at Joann’s. Used the Chevron pattern Embossing Folder from Darice. Trim was by Recollections found at Michaels for 99 cents. I should have took a picture before I opened it. I bought more but they are in a box I sent from Seattle and it hasn’t arrived yet. Here are some similar colors. On our way to the airport. Here is the bridge. Went to a fabulous all you can eat lunch at a Federal Way Japanese restaurant that was very reasonable in price. In the same area was Michaels. No penny items but a few bargains. Then we went to the Emerald Queen Casino. Made a donation to the casino. Bought boots the other day at Walmart and gloves from Harbor Court. Used some gardening tools and shovels. Found a place near Purdy. 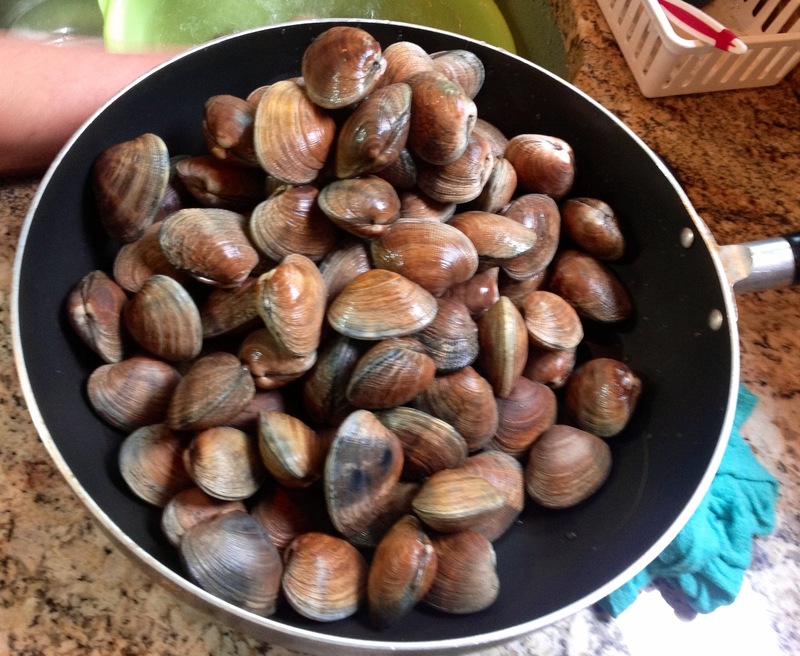 Limit is 40 clams per person. There were 6 of us. We got 240 clams in 15 minutes. You just dig a little and gather them up. Hardest part was hiking up and down to the beach since parking is limited. Here is some of the clams. Here’s the place we are staying at. 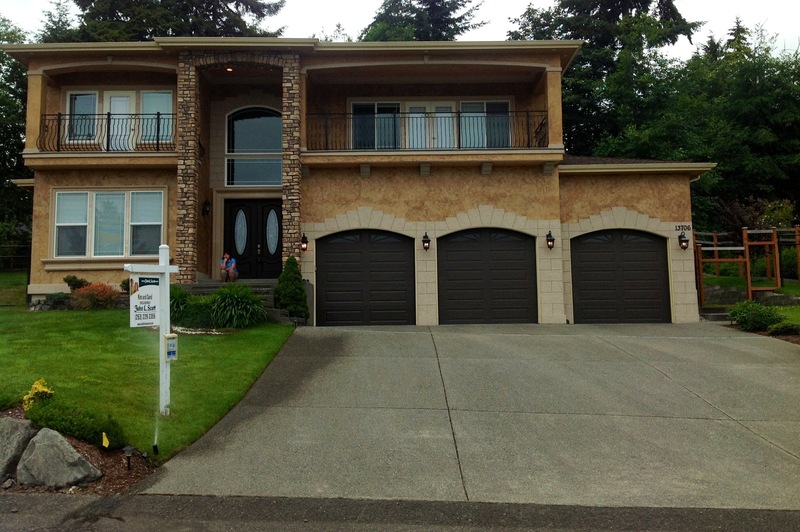 The owners want to sell this beautiful home and move back to Hawaii. till we head over to Gig Harbor. My sister-in-law does NOT have a TV. BFF Carol, I’ve finished the book you gave me to read on the plane. I’ll need to buy another book. Good thing I have my I-pad. over there. The cell phone does not always connect. Went down to the lake and found some stones. Bringing them back for a friend to make jewelry. Went to another Michaels in Tukwila. This was a nice Michaels and the cashier was so nice. No penny items at this location. The car stalled and needed to be towed. While we were waiting for the tow, went to check out a Chinese restaurant. It was called the Mayflower of China. I had to wait for my order so the owner gave me $9 coupons for next time. Giving them to my sister-in-law. The tow guy, Cergi was so friendly. He visited Oahu three times and the Big Island once. Went to Trader Joes in Olympia. Bought some drinks for the 4th of July. 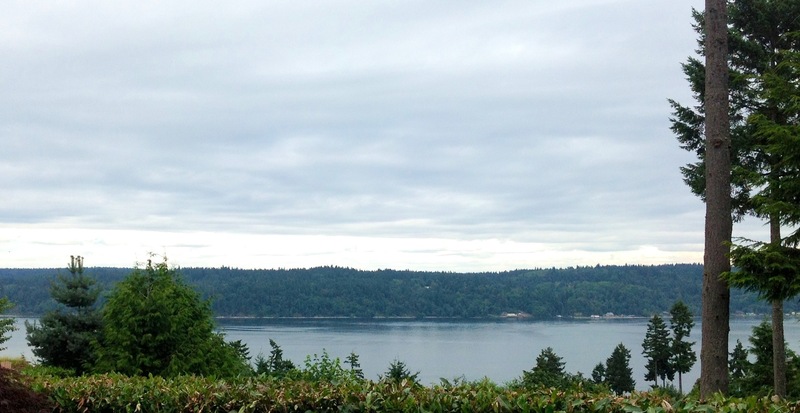 Going to Gig Harbor tomorrow and staying till Saturday. Got the fan blowing on me. 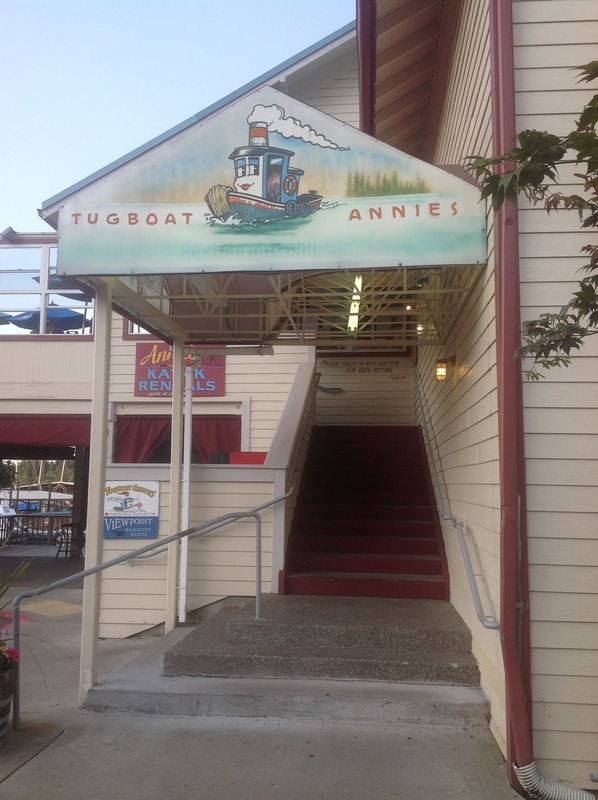 Had dinner at Tugboat Annie, off the water in Olympia. We bought these pull tabs. $20 got us 40 pull tabs. Here is the state Capitol. Went to Joann’s in Olympia. I found the Fiskars punch that I’ve been looking for and it was 50% off. Also found these Hello Kitty containers at 40% off plus I had a 10% off coupon. Went to get the fishing/clam digging permits at the market, Ralph’s. reinforce the hole. She used the cord from the casino we went to the other day. Here is the winner pull tabs.